In our underwear/overwear line, a simply fabulous petticoat! This wonderfully flouncy antique skirt is entirely hand-made of yards and yards of crisp, pure white percale cotton. Reaching almost to ankle lenth a very ample skirt boast two wide flounces, one underneath that is flat and bordered in a delicate Valenciennes style lace, and a second outer flounce which is elaborately embroidered and very gathered, giving it a densely ruffled fullness. The outer flounce measures 16.5 in. long and has a hand-scalloped border with open-work English cutwork flowers and leaves all throughout the border. The middle of the flounce is adorned with 13 hand-sewn small and medium pin-tuck pleats interspersed with two rows of white-work embroidery. The broad waist-band adjusts to fit all sizes, cinching with cotton draw strings that tie in a bow and gather the full skirt in at the waist. 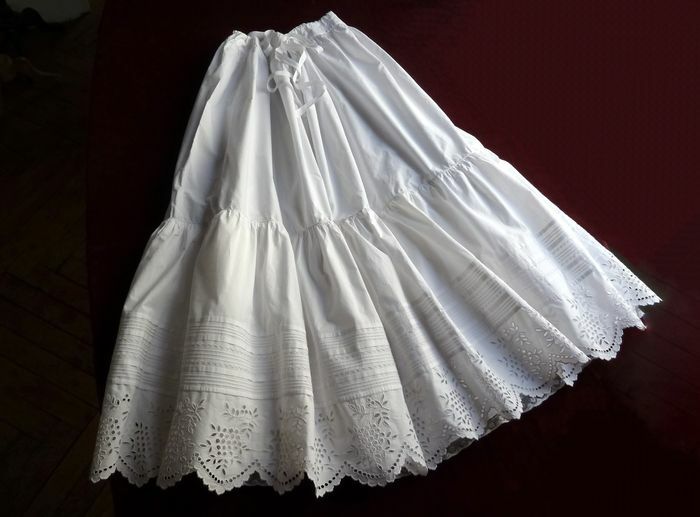 Perfectly romantic, very easy to wear, and ideal summer fare, this exceptional petticoat dates from the turn of the 20th century and is in impeccable condition. Dimensions: overall length 37in., circumference of skirt flounce (at widest point) 126in., waist: adjustable with drawstring from a maximum circumference of 50in.